Every year for my daughter's birthday I let her pick what she would like for dinner. Every year she picks the same thing. This pasta is about as unhealthy as you can get. It has rigatoni, bacon, fontina cheese, gorgonzola cheese, butter, spinach, red bell pepper, onion and a little brandy in it. It's tastes much better than it looks. 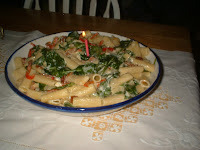 I didn't do a birthday cake this year because we made cupcakes the night before so I put her candle in the pasta.